JNN 20 Mar 2015 London : Millions of people in the UK and northern Europe have glimpsed the best solar eclipse in years. A solar eclipse is when the moon passes in front of the sun, obscuring its view either fully or partially from the Earth. A great swathe of the Earth’s surface was plunged into darkness as the Moon came between us and the Sun. For the Shetland Islands, the eclipse was at its height at 09:43 GMT and was very near total, with 97% of the Sun’s disc obscured by the Moon. Experiencing a genuine total eclipse required a trip north of the British Isles – such as the flight taken by a BBC camera crew and Stargazing Live’s Liz Bonnin, above the clouds in the Faroes. That footage revealed interesting features of the eclipse, including a clear view of “Baily’s beads”. These are the sparkles of light seen at the very edge of the Moon, where its rugged landscape allows the last rays of sunlight to peak through before full obscuration. Few land areas were directly in the path of the Moon’s deepest shadow – its so-called umbra – and seabirds probably had some of the most dramatic eclipse experiences. The period of greatest darkness – nearly three minutes – occurred over a spot in the Norwegian Sea, a little below the Arctic Circle, at 09:46 GMT. Scientists sought help from citizens with their research – even those in cloudy areas. A University of Reading team ran an experiment to learn more about how the atmosphere behaves as the Moon’s shadow runs over the Earth. The National Eclipse Weather Experiment (NEWEx) asked people to record conditions at their locality – any changes in cloud cover, in the wind, and in temperature. Study leader Prof Giles Harrison said: “Early analysis of the data shows some wonderful results, thanks to some excellent observations by our army of citizen scientists. “Along with a rapid drop in temperature, there seems to have been a reduction of cloud cover around central England, parting the clouds momentarily for some viewers. For almost two hours on Friday, the Middle East, along with countries in Europe and North Africa, witnessed the best solar eclipse in years. 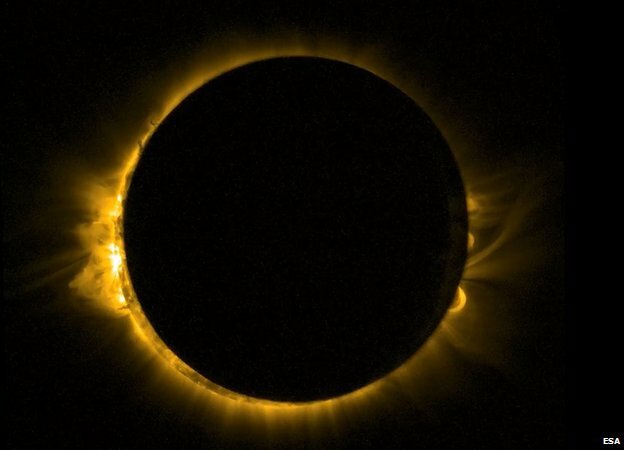 The partial eclipse was also seen in Saudi Arabia, Lebanon, Syria, Libya, Algeria, Egypt, Morocco, Mauritania, Iraq, and Jordan, the Beirut-based Daily Star reported. A few hours after the eclipse a Super moon is expected to illuminate the night sky as the moon orbits at its closest to Earth. Friday also marks the end of winter, as it ushers in the start of a new season with the spring equinox. While at the same time “ Navroz” the Beginning of Persian New Year also falls on Saturday at about 3.45a.m PST . Some Christian ministers believe that because all three events fall on the same day is the beginning of the end of the world, the Guardian reported. Scientists always warn people never to look directly at a solar eclipse as the sun emits harmful rays that can damage your eyes. This entry was posted in Europe, Middle East, United States and tagged Navroz, Solar eclipse, the Moon, total solar eclipse, uk, West. Bookmark the permalink.